Watching E3 this past week, two games really stuck out from the wave of announcements. What made them stand out, was the fact the games were in no way...serious. South Park: Fractured But Whole and Trials of the Blood Dragon are games that try to do one thing. Make you laugh. Among the various E3 conferences, each of the companies acted all serious about promoting their new games. Yet, here comes Matt Stone and Trey Parker who really do nothing but joke and talk about Fractured But Whole. Same could be said for the WWE entrance style of the Red Lynx developers who went on to announce Trials of the Blood Dragon. Developers try and joke, but most of them are forced puns, while the South Park creators are just being themselves and it works. The games are each funny in their own way. For South Park, it’s obvious, the series thrives on creating understandable satire by skewing what’s in the news, and the latest fads. 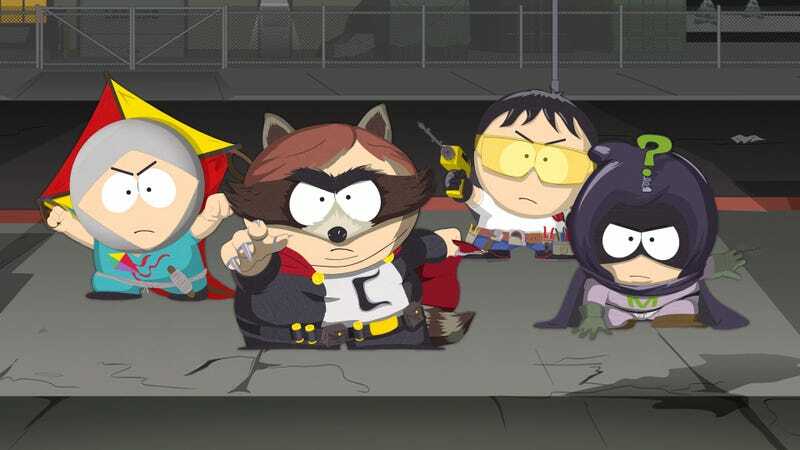 The sequel to the popular Stick of Truth, Fractured But Whole takes what we loved about the previous game, and just dumps the current Marvel and DC movie universes all over it. Trials of the Blood Dragon, takes what was great about Far Cry 3: Blood Dragon, which was everything, and translates it to the Trials series with great effect. Which makes me believe that we need more games that make humor a much bigger part of the game. It’s nice, that after playing a few hours of games like Dark Souls or Call of Duty, that there are games like No Time to Explain. A game where the gameplay is simplified, but humor is at the forefront. There are plenty of games that try to maximize the humor while giving us enjoyable gameplay. From point and click adventure games like McPixel and Randal’s Monday to RPG’s like the Penny Arcade series to shoot-em-ups like Broforce. The idea being that these games in no shape or form, take themselves seriously. Which in an industry that is filled with games that have a serious attitude, is a good break. I have no issue with serious games, I have fun playing CoD online with friends, and some people take joy in invading people in Dark Souls. It’s just nice to have games dedicated to looking on the bright side of life and humor. Some days after a stressful shift at work, I’d rather laugh it off, than try to find relief in games that involves shooting and slashing. So take a break from the normal humdrum of everyday seriousness. Play a game, where its only purpose is to make you laugh and enjoy life.